The Pew Research Center is one of the mostauthoritative and reliable fact tanks in the world. The research it conducts proves time and time again to be extremely useful, thorough and influential the world over. One of the most eagerly anticipated reports for the online marketer is of course the Social Media Update that it releases at staggered times throughout the year. The most recent came out in January, and here at 201 Digital we thought you’d all be able to benefit from and take some action on your social media strategies based on its key findings that we shall relay for you here. The research was conducted in September 2014, and the results are based on American adults who use the internet. We hope you can make use of the findings. So, perhaps predictably, Facebook is still by far the most popular social network. However, as can be seen from the above graph, not only is its growth slowing, but it is the only social network that is doing so. The others do, of course, have a fair way to catch up, but, with the likes of LinkedIn and Pinterest enjoying a whopping hike of 13% over the past 2 years, it’s certainly safe to say that none of these sites can possibly be ignored any longer as part of any company’s social media strategy. So, although it is still the most popular social network, Facebook’s growth figures have finally ground to somewhat of a halt. 71% of online adults now use the site, a proportion which represents absolutely no change from the 2013 report. However, Facebook’s engagement levels continue to grow. A quite significant rise of 5% of online adults now use Twitter, up to 23% from 18% in 2013. The site is most popular with those under 50 and the college-educated. Up now to 26% from just 17% in 2013, Instagram has seen a rise in nearly every demographic, with the most significant being found in the young adult segment, jumping up from 37% in 2013 to 53% in 2014. There is also a notable rise in women and Hispanics. Women still dominate Pinterest, with a whopping total of 42% of all online women registered on the site (compared with just 13% of men – though this figure is up from just 8% in 2013). 28% of online adults now use the site, which is up from 21% over the previous year. Still most popular amongst graduates, those in higher-income households and the employed, online adults using LinkedIn is up to 28% from 22% in 2013. A notable stat is the jump in unemployed users from 12% in 2013 to 21% in 2014. LinkedIn is also notable for being the only platform whose users are more likely to be between the ages of 30 and 64 than between 18 and 29. 56% of online adults aged 65 and older now use Facebook, representing 31% of all people in this demographic. 53% of young adults aged between 18 and 29 use Instagram. 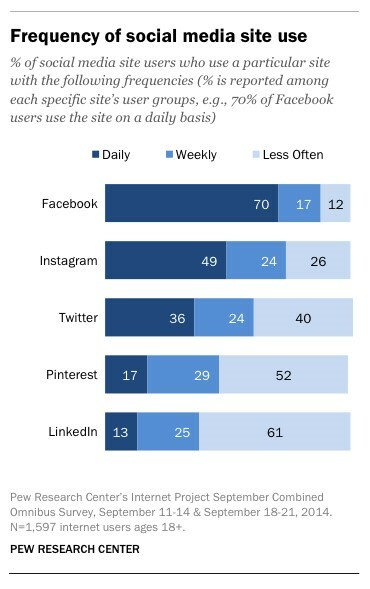 49% of Instagram users use the site on a daily basis. 50% of internet users with college educations are now, for the first time ever, using LinkedIn. As mentioned above, although Facebook is the only site whose growth seems to have stagnated, its usage is still the most prevalent amongst the bunch. 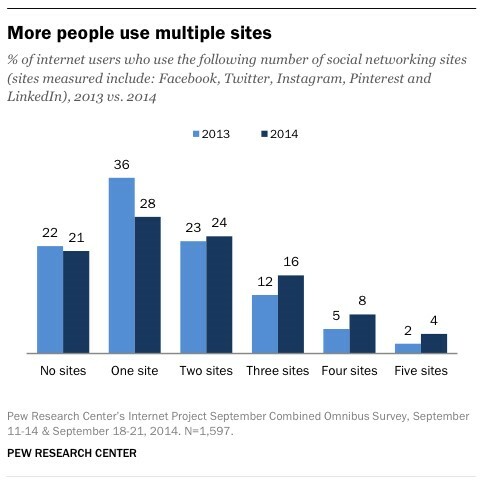 52% of online adults now use more than one social media site – up from 43% in 2013. Facebook again retains the lion’s share of those who just use one site at 79%. Another truth is that for users of 2 sites who favour either Twitter, Pinterest, Instagram or LinkedIn as their number 1 site, Facebook overwhelmingly is their number 2 – the lowest figure being a massive 86% of LinkedIn users who are also on Facebook, and the highest figure being 94% of Instagram users who also use Facebook. 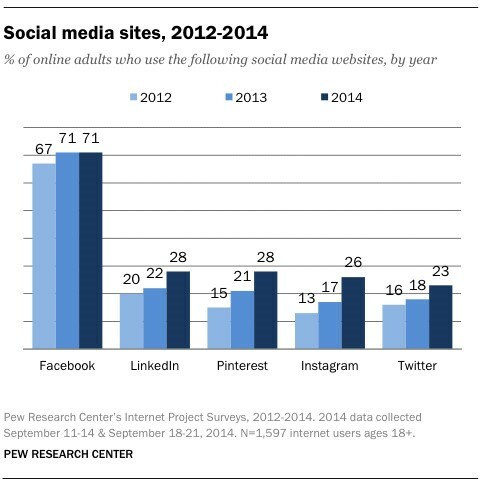 So that rounds up the key findings from the Pew Research Centre Social Media Update for 2014. As always, the information presented is very enlightening, and should be viewed by social media marketers with keen interest as to where to focus their efforts throughout the coming year. You can view the full report here.